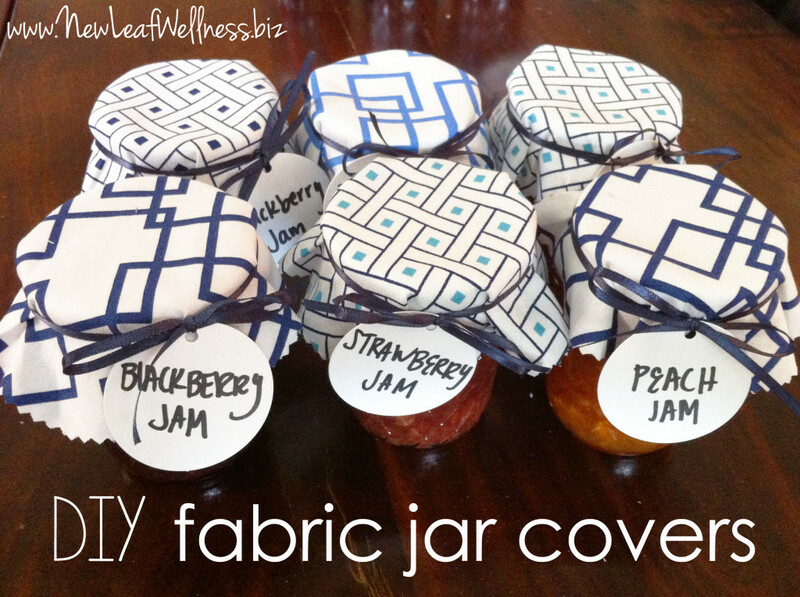 Create your own fabric jar covers for less than $5…in less than an hour! This may be my favorite DIY yet! 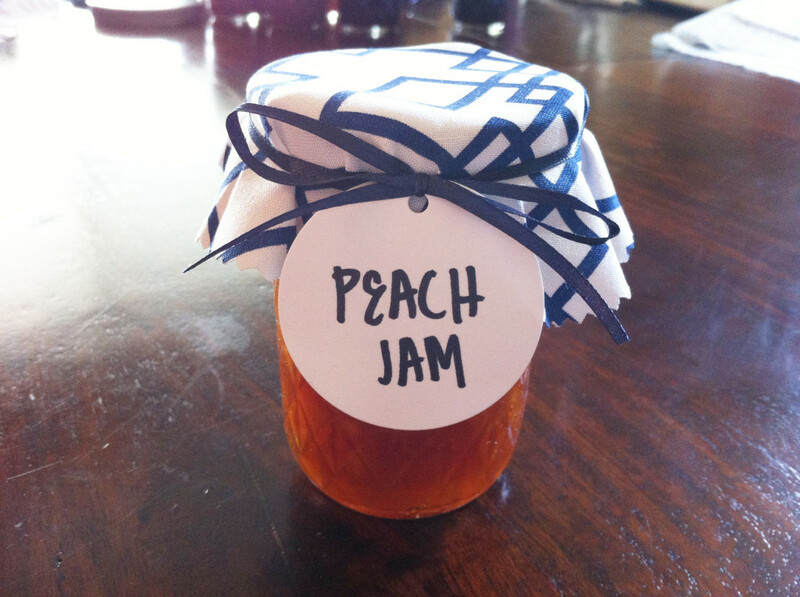 Since canned goods stay fresh for at least a year, I have grand plans of giving every friend and family member a homemade jar for Christmas this year. I’ll probably be giving them out for birthdays, housewarming parties, and new babies too. I wanted to come up with a cute, easy way to cover and label my canning jars. My super-crafty Mom told me that she made fabric covers for all of my Grandma’s homemade canned goods in the 80’s and 90’s. Genius! I went to my local craft store and spent a whopping $4.00 on fabric, ribbon, and tags. Cute AND cheap?! Wahoo! One fabric “fat quarter” – You’ll find these in the quilting section of the craft store. 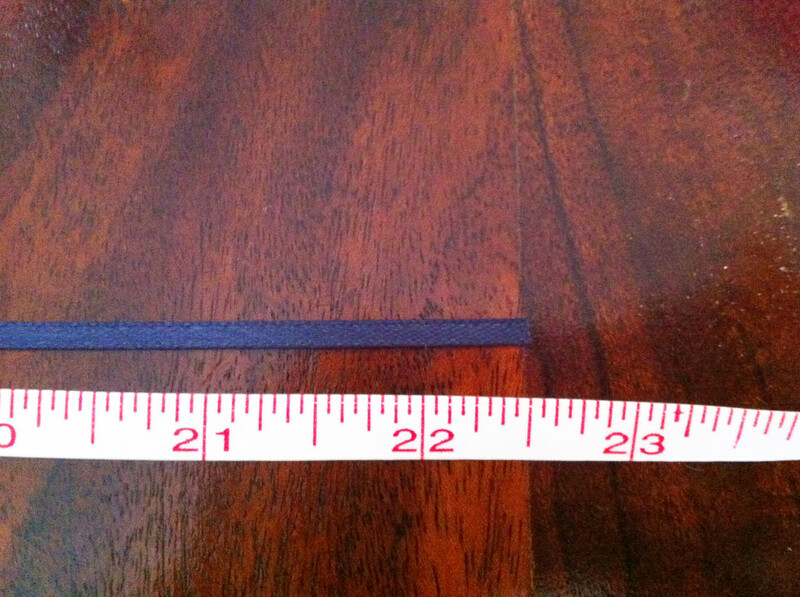 Each one measures about 18″x22″ and there are 4 fat quarters per yard of fabric. (You can also use scrap fabric or fabric by-the-yard.) 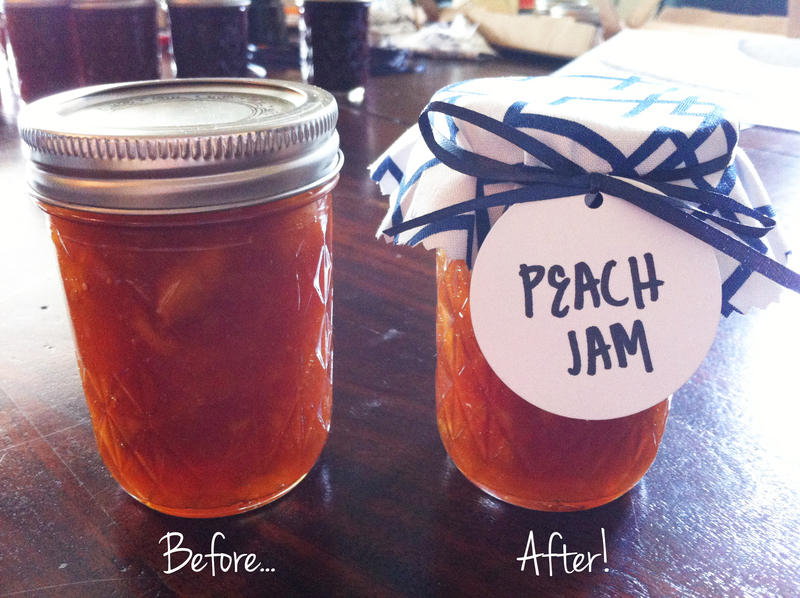 One fat quarter is enough fabric to cover 9, 8oz jelly jars – or 12, 4oz jelly jars or 4 quart-sized jars. One 10-yard spool of elastic ribbon that is 1/8″ wide or thinner – This is enough ribbon for 16, 8oz or 4oz jelly jars or 15 quart-sized jars. 1. 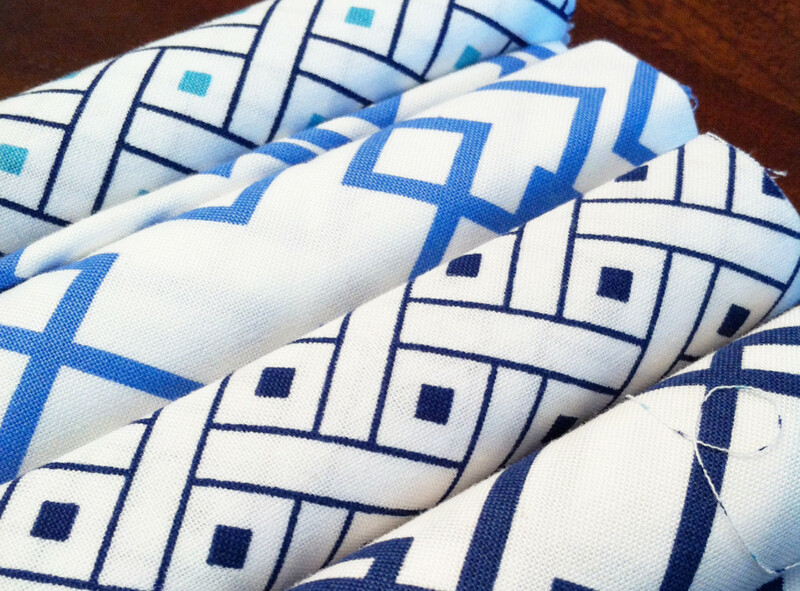 Iron your fabric to get rid of any lines and creases. You’ll need to iron your fat quarter because they come rolled up like this. 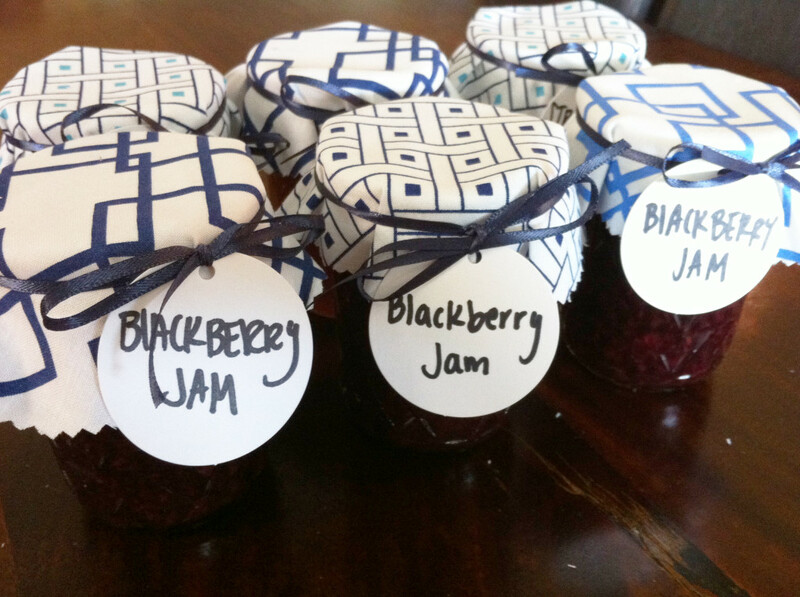 I bought four because I have a lot of jars to cover. 2. 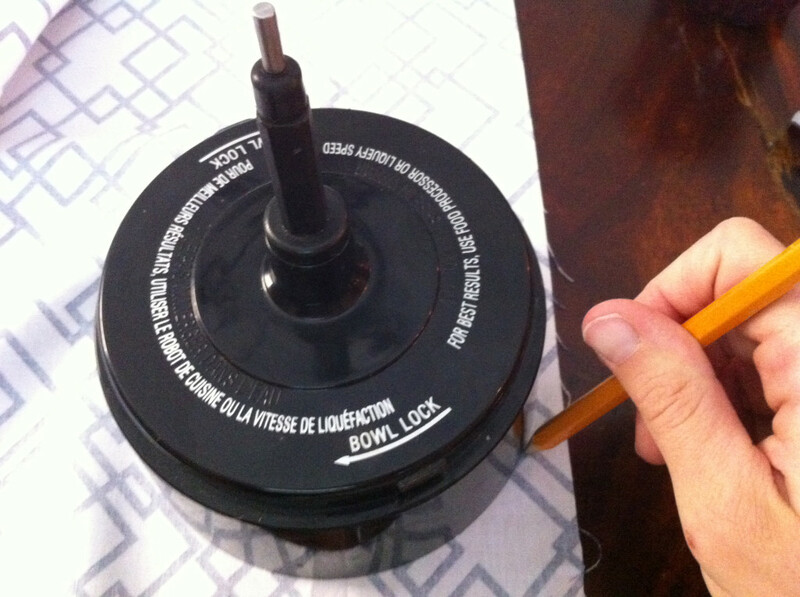 Place your round household item on the backside of your fabric and trace your circles with a pencil. 3. Cut out the circles with your pinking shears. 4. Cut your ribbon into strips that are 22.5″ long. 5. 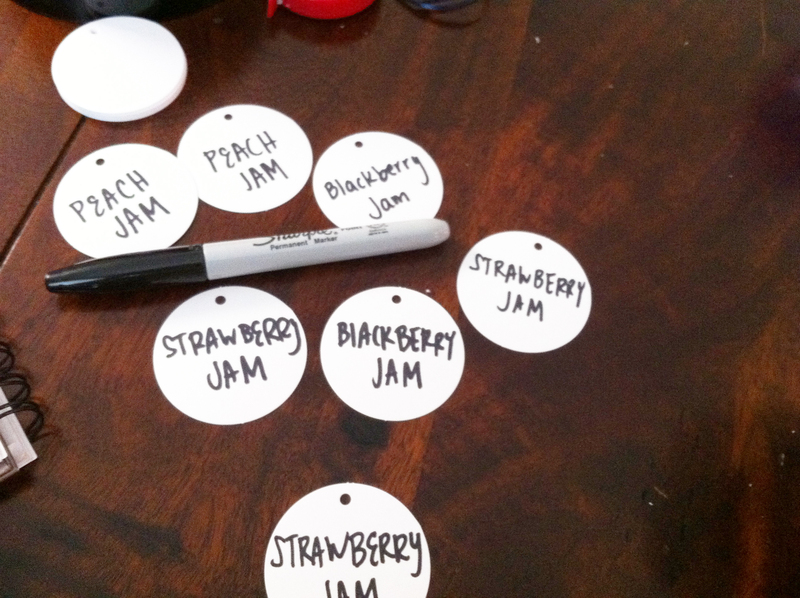 Write on your tags. Here are the ones that I bought. 6. 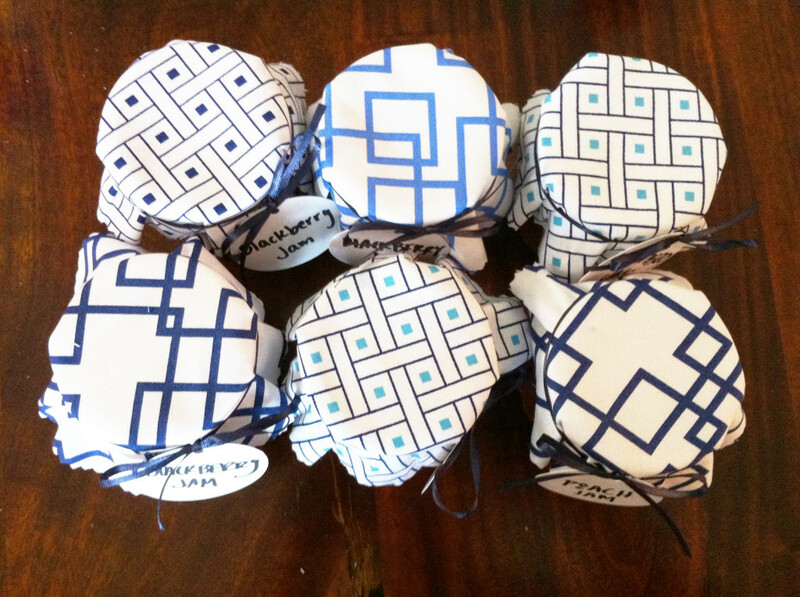 Pick up your first jar and center a fabric circle on the top. Secure with a hair tie below the screw band. 7. 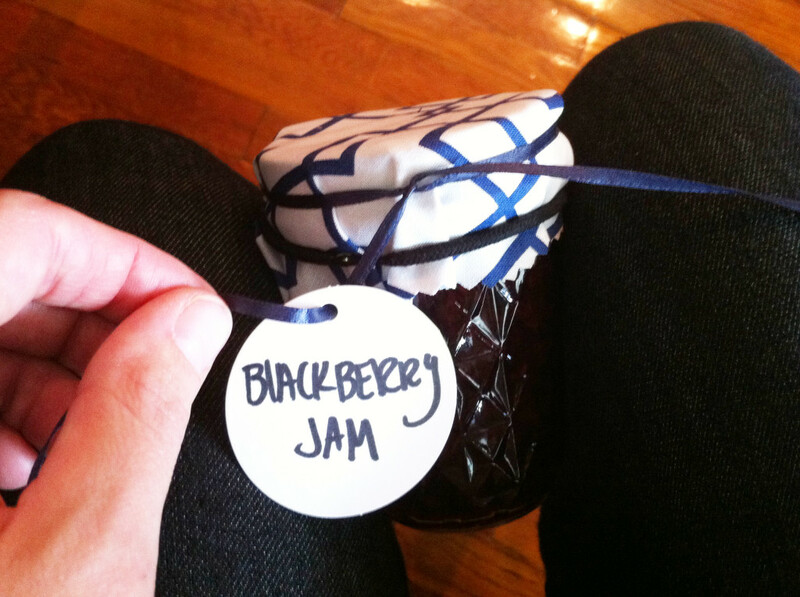 Loop a piece of ribbon around the top of your jar and tie into a tight knot. 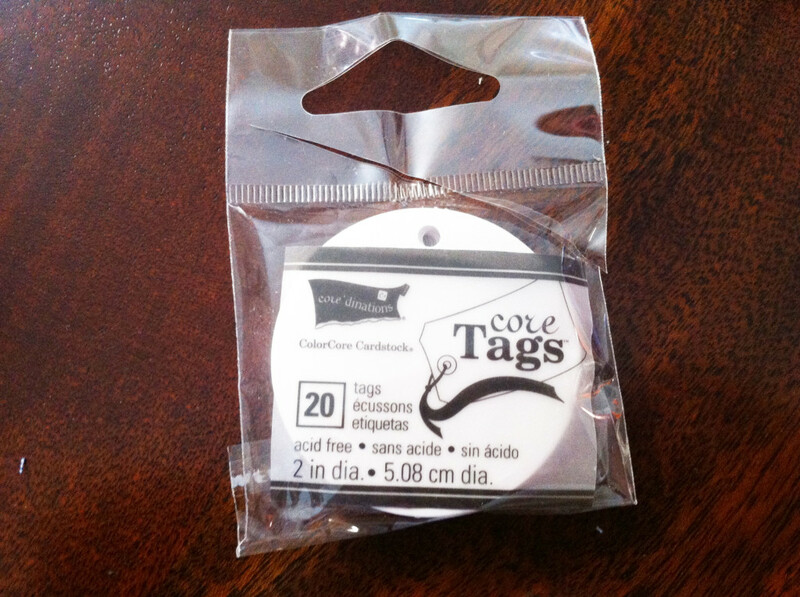 Add a tag and tie into a bow. This was the most time-consuming task for me because I didn’t use elastic ribbon. Please make your life easy and buy the elastic ribbon, ladies! 9. Repeat steps 6-8 for remaining jars. Iron your fabric to get rid of any lines and creases. 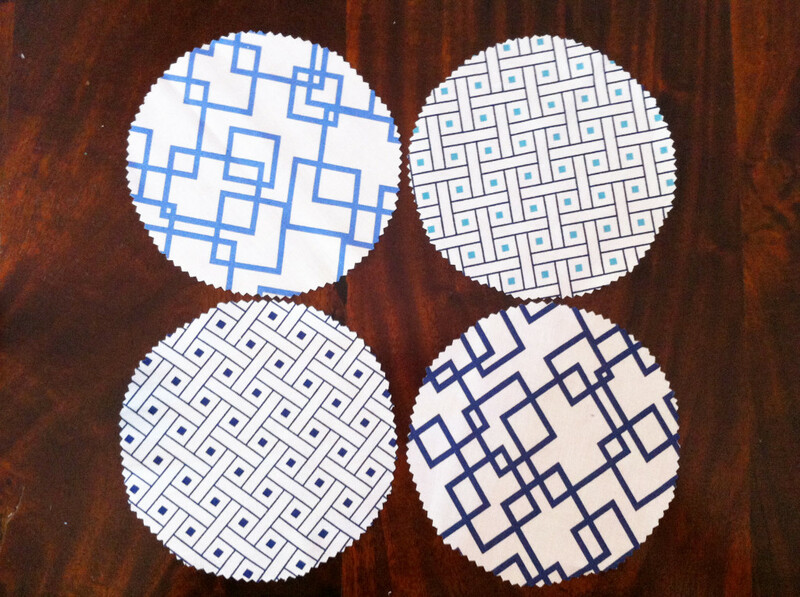 Place your round household item on the backside of your fabric and trace your circles with a pencil. 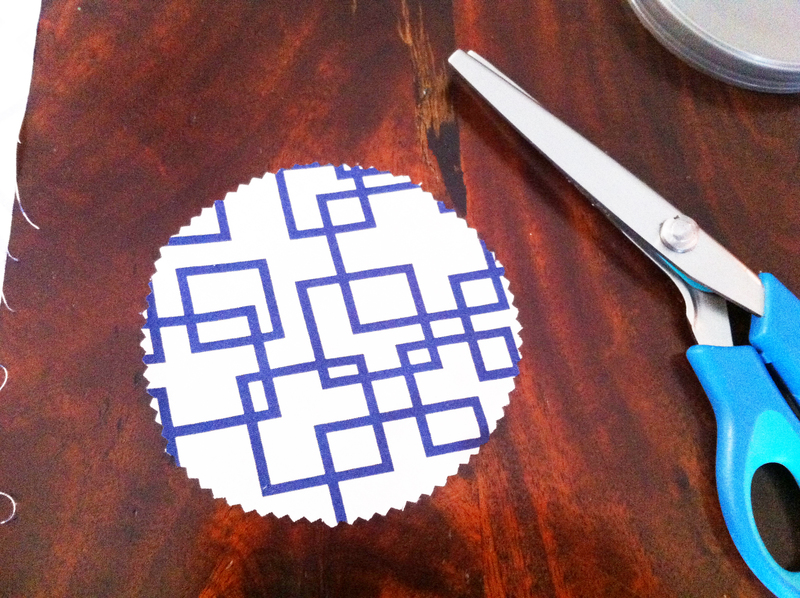 Cut out the circles with your pinking shears. 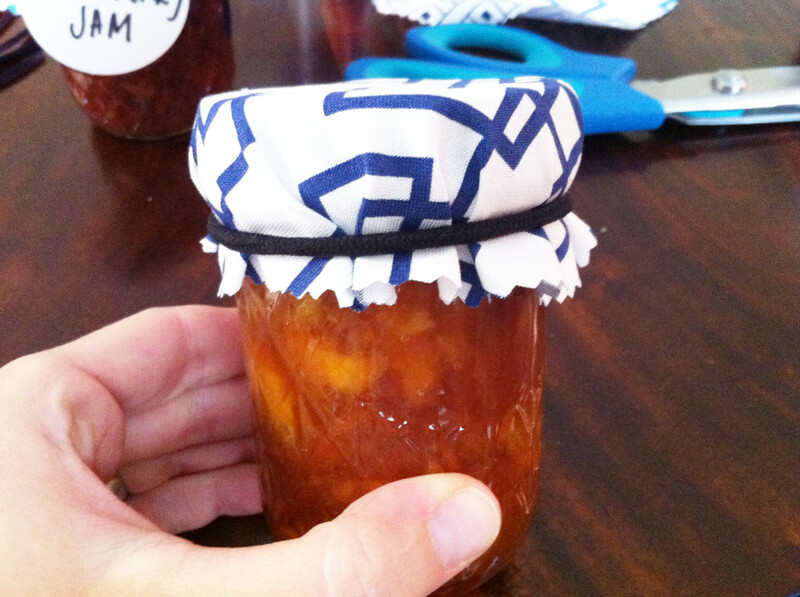 Pick up your first jar and center a cut piece of fabric on the top. Secure with a hair tie below the screw band. Loop a piece of ribbon around the top of your jar and tie into a tight knot. Add a tag and tie into a bow. Repeat steps 6-8 for remaining jars. 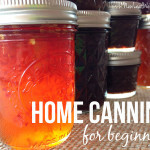 Tell me: What are you canning this year? Do you have any other tips for making canned goods look super cute? 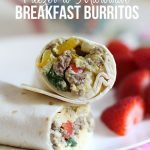 PS Be sure to follow me on Pinterest @kellymcnelis for more recipes and fun DIYs! I used canning jars to make sand profiles of my local shoreline for thank you gifts to friends and relatives not in California and wanted a cute way to top off the jar. Instructions were easy to follow. Thank you! Yay! Thanks so much for letting me know. Love the idea of creating sand profiles in jars. Is it just me or is this kind of a waste of time? I mean it’s a pretty long tutorial for throwing a piece of fabric over a cap- it’s not rocket science. 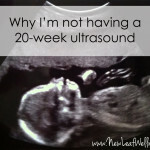 No it’s not rocket science, so why are you on this site? It’s great information for those starting their business on a budget. I actually appreciate the step-by-step instructions. Great tutorial, using it for my Sunday School class tomorrow as it is Mother’s Day and we are making jars with bath salts in them. This will make them so pretty. Thanks! Great idea!! I may use Christmas fabric! Thanks so much. Thank you! This is exactly what I was looking for, as I’m not as intelligent or crafty as the “rocket science comment” person. And…would have used the wrong scissors… Appreciate your step by step process.